As I already wrapped up my own thoughts regarding Kill la Kill, Space Dandy, Pupa, and Gundam Build Fighters last week, I’d direct folks to my spoiler-filled thoughts there rather than reiterate my points. I’ll save Nagi no Asukara for its usual spot next week. Winter 2014 Shows I Also Watched But Was Not Writing About Weekly. If one averages my scores together from across the nine total seasonal shows I finished, I came out at a 5.77 (It jumps to a 6.375 if Pupa is removed). Which sounds about right, I’d say. It was not a bad season at all for me, my total spread just may not have been blowing my socks off as much as it could. The likes of Mazinger Z, Getter Robo, and other assorted famous mecha series of the old days parodied via the antics of athropomormized magical girls? Well, that is one way to get my attention. I do think this is a rather solid premise though. A wide assortment of giant robot franchises with iconic and influential positions in anime history, and then reinterpreted to fit into a different genre space. It can have some fun mythology gags, see how different units would perhaps get along under such circumstances, and what their personalities may perhaps be. On all those fronts, there was solid work. While many of them may boil down to one note jokes, every character did feel different from each other. I never had a problem telling who was who once they introduced a new individual into the mix, and with the three episodes consisting of three stories each the show trots out a number of them. Of course there is the matter of how one even approaches adapting the machine designs into outfits, and some fun stuff got pulled out there. As these tended to be the more entertaining parts for me, I do not really want to spoil them much. But, as one of the first ones for instance, the twin headed Doublas M2 is turned into a little girl who talks via dinosaur handpuppets! Stuff like that is fun. 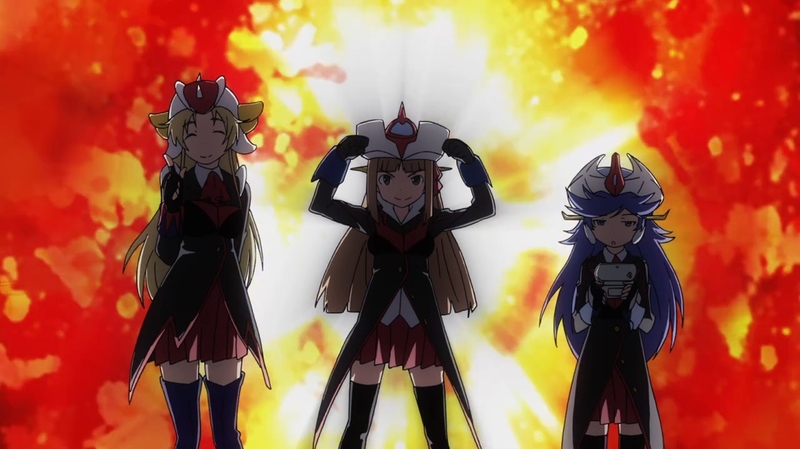 Meanwhile our leads, as the embodiments of Mazinger Z, Great Mazinger, and Grendizer had a fitting wardrobe. Their more magical girl oriented uniforms take the angular crests and the like from their namesakes and manage to make a profile that is both in keeping with the history while cutting their own look for the setting. It is a really swell blend to see, and the same does go for the other super robots that show up as well. But there is one thing. And it is kind of a quite prominent thing. While this series had fanservice gushing out everywhere due to the historic nature of many of the shows being parodied, there was also a lot of straight up body service as well on tap. Maybe two giant robot icons cooing and moaning over each other suggestively would be really funny if they were actually in their traditional robot forms, but here it just… isn’t. And the camera sweeps up characters skirts, there are several scenes of sexual assault on underage girls for comedic purposes, and so on. This material really could have stood on its own without the need for such shenanigans; it was able to generate some swell laughs from me the rest of the time! For me, all the random sexualization serves is to grind the more genuinely amusing material to a halt every now and again out of a notion that because of the changes these characters also need to serve as a masturbatory aid. And I just do not think about Mazinger Z and underage girls that way. Best ending credits sequence of the Winter 2014 season. Hands down, no contest, royal flush, Wooser wins all the chips. I actually feel fairly indifferent to the first season this is a sequel to. I did not dislike it, but I was never really pushed into a positive comedic zone either. It was average. The original Wooser’s Hand-to-Mouth Life had this tendency to fall into the kind of humor where it would make a reference, and that would be the joke. Like, Wooser sitting on the sofa in a Cyborg 009 outfit. I liked the character of Wooser, with his dry thoughts and delivery while being a cute design who has a number of inappropriate considerations. The script just rarely ever gave him much to do. Here in the second season, I definitely cracked more smiles and laughed. The references are still there, but here they better flow with the script. It makes stronger jokes out of the characters personalities and quirks. It has better timing, and is more ambitious in scope. 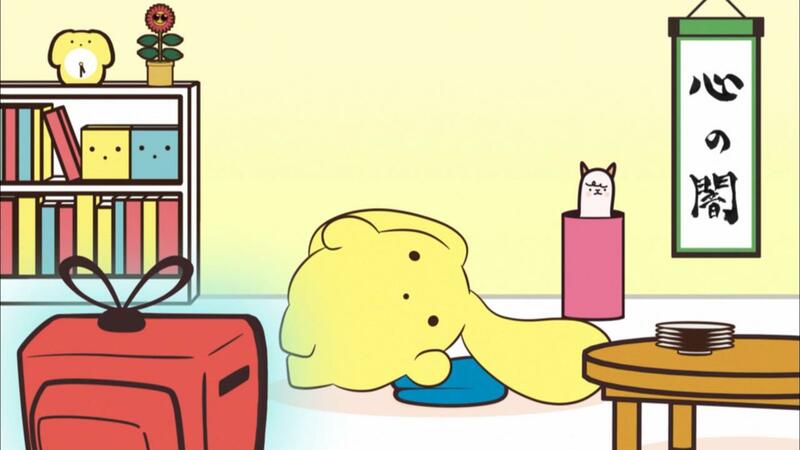 Wooser isn’t just a character I know is supposed to be a lazy, sarcastic, deviant, cute and cuddly dude. He has more layers to how that is shown and acted upon, as well as some additional heartwarming moments for added complexity. The series does still have a condition where all of the other characters who are not Wooser just sort of exist around him. Even as a series of shorts, I can not remember several of their names off the top of my head, while I can recall more characters from other short episode anime I watched far longer ago. As a result, in episodes where Wooser is really on his game in the smart remarks department, he buoys everyone. But when he isn’t so much, the show tends to drag. Maybe one can see a kind of commentary in that regarding just how important Wooser is to his friends despite how he may treat and dryly objectify folks. Maybe this comes from the series originally being conceived by a member of Supercell as a journal column and there just being a better handle on the lead figure. The series swings up and down, but for me it is livelier than it was before and I can say I liked it. Perhaps if there is a third, the team can go even further. I enjoyed the first season of this show quite a bit back during the summer months. It was a solid take of a city boy coming to learn the strengths, differences, and similarities of farming and rural life to what he used to know. It had a number of characters to rotate around, the agricultural class practicums, and had a swell arc for our lead. As I grew up in an area where my neighbors were an alpaca ranch and my elementary school was next to a dairy cow farm, I saw some great sentiments I could draw up from my own life in there. Silver Spoon also really did not need a second run for me though, as I do think the initial season stands well on its own with a good conclusion. That this additional set of episodes seem sort of lost confirms this for me. The classroom practicums get largely expunged, and our set of varied schoolmates tends to fall more into the background so the series can highlight more of Yugo’s relationship with Aki. Ayame Minamikujou is introduced as this new sort of friendly antagonist character, and even finds their way into the introduction credits, but the series does not have anything for her to do outside of really two things. She is quickly forgotten. We have more traditional drama territory now with concerns for things like farm finances, but it does feel as though the material is trying to punch above its writing weight class. There is more extensive uses of flashbacks at key moments, as the series attempts to tell me what I should be feeling rather than trusting in itself to have been able to lead me to put two and two together on my own. It takes me out of the moment again and again, and to a degree it feels like this season is on autopilot. We developed Yugo’s arc well enough in the previous season with him coming to grips with his new school and acquiring fresh friendships that it presents a problem with what the show should focus on now. And I’m not sure it really ever found an answer. Which is not to say there were not parts I enjoyed. The various classmates are still great characters when they do show up in their different capacities, there is just less of their antics to go around. 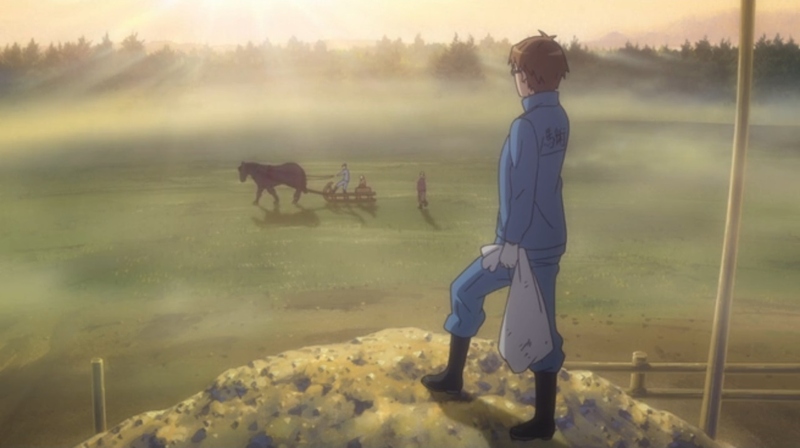 Nakajima is still an enlightened Equestrian Club mentor and a fun to watch cheese maker. Maron The Horse retains that sneering look of contemptuous judgement. I “merely” liked this season, but I did not love it as much as the first, is what it comes down to. This was my anime of the season, and I am often not one who is drawn to endeavors like The Office. That said, this company is literally Hell. So it can have a ton of mythology fun in addition to whatever requisition forms need to be filled out. This works due to how the Narakas of Buddhist tradition operate as something akin to subdivisions and branches that one can view as a kind of clerical structure. Likewise, as there are multiple religious traditions in the world, folks like Satan pop in as leader of the separate European Hell. The result is this fascinating mix of workplace issues, religious lore and mythology gags, pop culture references, and all the rest. Hozuki and King Enma still eat in the cafeteria, various individuals have fun quirks due to how they were reinterpreted from lore, and so on. What I do give immense credit to is the script, as it had a fiendish task in order to even begin to make this work. In that respect, I thought it keenly balanced the use of mythology gags with more situational character humor. 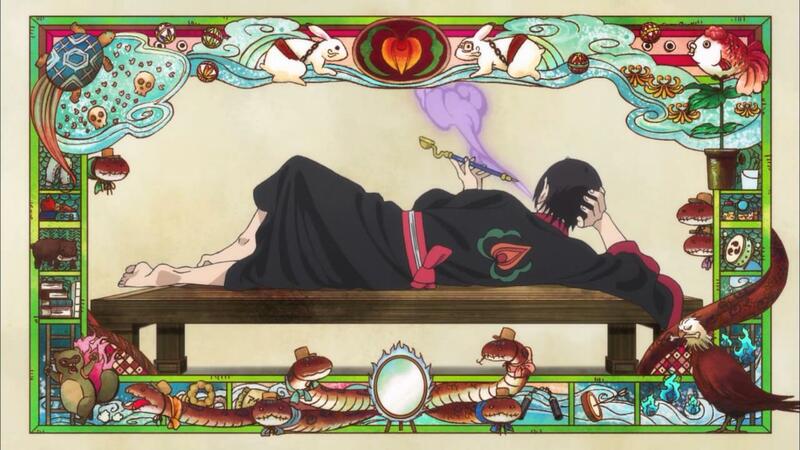 Hozuki at times does explain some of the history of certain individuals, but it is important to note he only ever does so to characters who genuinely would not know or to a crowd setting. As a result, his dialogue in such circumstances comes off more as an actual conversation or explanation he would make in universe, rather than an exposition dump for our purposes. It keeps things zippy and with a better flair while still pointing key elements out it wants to drive across, which is great screenwriting at work. And even in the event one misses too many of the history nods (and there are a number of them), there are other things like a dog talking about Labor Standards Acts, or Hozuki’s ability to strike fear into those around him despite “only” being Chief of Staff. Likewise, I found the art aesthetic to be rather enchanting. I’m not sure how much of this is due to the cash haul from Attack on Titan, but for their second television showing Wit Studio pulled out all the stops here. It is a vibrant and colorful display with a lot of applied inspiration both in style and character design from traditional art prints. Some of that is of course from the manga this is an adaptation of, but they still needed to make it function as a work of animation. If anything, my biggest complaint really comes down to the show consisting of thirteen episodes with two stories each. I want to see additional interactions from Gozu and Mezu. I require more Satan. Peach Maki needs to bring more of her endearing fruit flavored idol antics to the afterlife (also, as an aside: I really enjoyed how characters like Okou, Dakki, Lilith, or Peach Maki were clearly presented as attractive or even sensual figures, but the series never turned them into cheap skin service). The show introduces so many enjoyable characters, and yet we rotate a lot of them out pretty quickly. If there was more to the series, like say Polar Bear’s Cafe which also did the half episode game in a workplace environment but ran for much longer, then I would be rather content. It is to their credit that so many characters caught my eye in such short timeframes and I want to see their continuing adventures or longer episodes. But I can also see the value in Wit ensuring they were able to better time those interactions to maximum effect, as well as ensuring they could double down on the more complex art style rather than risk the production issues they slammed into with Attack on Titan. Nobody wants to make a habit of conscripting emergency staff via Twitter, after all.